The Tithe Barn, which is owned by the Crown Estate Commissioners, is located off Priory Green immediately to the north of St George's Parish Church, and within the former precinct of the Benedictine Priory. The buildings and yard that comprise the Tithe Barn are shown on the plan below. The plan also shows the location of the Tithe Barn as being situated near the centre of the village. "16th Century in origin, much altered and with survival of original features. Walls random rubble. High pitched slate porch to each long elevation. Crucifix plan. East Doorway with central double doors in heavy oak chamfered frame. Later single casement windows to each side of doorway. Three buttresses to west side. Slit windows to gable ends. Open timber roof renewed". The main structure of the Tithe Barn is of random rubble red sandstone walling, with a steeply pitched slate roof, capped with ridge tiles. The main doorways to the east and west elevations have hipped roofs and the doors are set in heavy chamfered oak frames. Three stone buttresses have been added to the west side. Generally the windows are later casements with slit window openings to the south gable and elevation. Two large and two small roof lights have been introduced into the roof slopes. Internally the barn consists of one large single storey space which has had a partial open first floor inserted at the south end. In addition there are four smaller side rooms one of which also has an upper floor providing additional storage space. Over the years a row of single storey buildings have been added along the southern boundary of the site. The earliest addition immediately adjoining the Tithe Barn is probably late 19th century and is of rubble red sandstone with a slate roof. The remaining buildings are of rendered blockwork with double roman tiled roofs and were probably erected about fifty years ago. The buildings have been used since the second world war as a builder's workshop and for the storage of building materials in conjunction with the repair and maintenance of Crown Estate property in the locality, and before that, by the Luttrell Estate for similar purposes. The main part of the Tithe Barn has internal dimensions of approximately 23.5 metres (77 ft) long by 8 metres (24 ft) wide and, together with four further separate rooms within the principal building, there is a total of almost 297 sq metres of floor area. 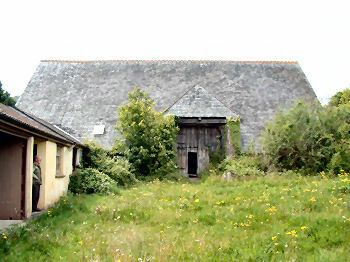 The outbuildings contain a further 132 sq metres. The site area excluding these buildings is 837 sq metres and is enclosed by stone walls. Vehicular access to Priory Green is provided on the north side of the yard. There is a further triangular area of land to the west of the Tithe Barn, which we understand to be in the ownership of the parish and is used, in the main, for car parking. All main services (including telephone point) are currently provided within the site or are available in the immediate vicinity. There is a 100 mm (4") water main and a 50 mm (2") low pressure gas main in Priory Green. A gas supply is not at present available in the buildings. 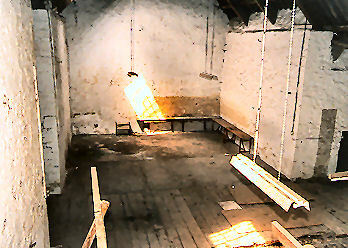 Electricity is supplied from overhead wires at the south-west corner of the Tithe Barn. The Tithe Barn is connected to the main drainage system and there is a manhole approx 2 metres (6.6") to the south in the adjoining village gardens. A Building Condition Survey was prepared by Shaplands, Chartered Surveyors of Dawlish, South Devon, in June 2002.